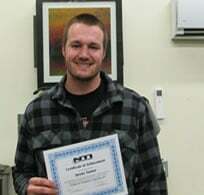 HVAC/R Technician student Dexter Turner is Bangor’s Student of the Month for February, 2017. All-round nice guy, Dexter Turner is the type of student that is exemplary to his fellow classmates in the HVAC/R Technician program. Since he joined the Bangor campus last November, he has approached everyday with an eagerness to learn and a positive can-do-attitude. Always listening to his instructors intently to catch every new concept presented to him, Dexter has excelled academically. His polite and courteous demeanor adds to making him an all-star student among his peers. Dexter’s, passion for learning, his disciplined attitude and great attendance record has earned him the title for February 2017’s Student of the Month! Congratulations Dexter!